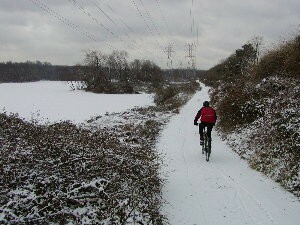 After Wednesday's hike-a-bike in the snow I debated what today's ride should be. I was leaning towards a road ride, but was entertaining the thought of making another run at the trail, which was where I really wanted to go. Then again, I knew that was going to be more pushing than pedaling and I was going to be doing that on Sunday after the bike swap, so that idea fell to the bottom of the list. The 44 Mutano knobbies were mounted up on the X-check (my road bike) but I didn't feel like switching them out, and a pure road ride didn't feel that appealing today anyway. The Mutanoraptors roll better than you would expect on the road, but they are still sluggish and the rear is too fat to run my fender. A quick call to Bill decided my ride for me. I drive my car far more than I would like to, so now I've got a destination, I don't have to ride aimlessly. I head to his work shop to get some work done, loading up the one speed utility bike. That's only one of its names, it also is referred to as the Blue Bike, the beater bike and the townie. 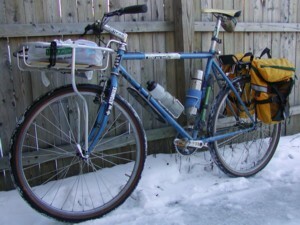 It's a rescued '91 Specialized outfitted with a Paul's Flatbed rack and a Jannd rear rack. Today I threw on the Arkel panniers and rolled out. It was around 20 degrees, the temperature all of my rides seem to be in lately. It's my first ride on the bike since it's been put back into street action. It was serving temporary dirt duty for a visting friend. The rear wheel was sporting an 18 tooth cog for that incarnation and I decided to leave it on instead of putting the 16 back on. I figured the lower gear might be usefull when loaded down with groceries and hitting the big hill on the final appoach to my neightborhood. Up front is a 42. So far the bike has run 44x16, 42x16 and 42x18. Given it's usage, the gearing on this bike isn't that critical, but after today's ride I'll put the 16 back on, I was spinning out to much. Fans of Mike Watt, former Minute Man, might be interested to know that he is in the process of recording a new album with his bass/drums/organ punk trio The Secondmen. These boys rock, as I caught them when they passed through Mobtown earlier this year running through the new songs for the album. Mike recently wrecked on his bike and injured his arm. Despite the pain, he's soldiering on making the new album. You can read diary entries from all three guys as the process goes on. Click here. And if you missed it when it came out in hard copy, you can read the Dirt Rag interview with Watt right here. Speaking of jamming econo, have you caught issue #13 of Cars R Coffins? If not, do it. There's an excellent write up about a nine week single speed bike tour through Vietnam, Cambodia, and Thailand. And CRC has new wool socks too. In case you don't know, wool rocks. Despite valiant efforts on the Wednesday night ride, our success was limited. At least eight inches of snow were on the ground with virtually no tracks of any kind on the trail. A few foot prints and a set of x-country ski tracks were encountered at various points, but mainly we were breaking trail. If you weren't going downhill, you weren't riding. Even then, it was tough to get going and keep a good track. At least we weren't cold and the scenery was good. It was a nice 19 degrees out and despite the call for howling winds, the air was pretty calm. After fighting the snow for what seemed like many, many miles, but was no where near that distance, we threw in the towel and headed back to the car. A couple of pizzas and some cold beers and that's all she wrote. Oh well, until next time. The new studded tires held up fine. No flats (excellent! ), but with the deep snow, a true test of the traction is still yet to come. They faired fine on the iced-up streets and alleys in my neighborhood, but I'm anxious to give them a full workout on the trails where things really count. We'll see how long I have to wait for that. And if you are in the B-more area, don't forget Sunday is the annual RPM Cycle Swap in Westminster. More snow overnight, six inches or so. Made me want to play hooky and go ride the trail. Didn't happen. After mid-morning, things turned to a wintery mix of freezing rain and sleet. Less than expected, but more forecast. 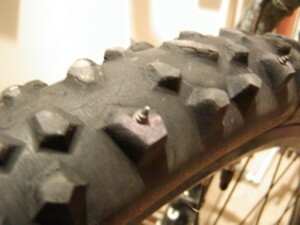 So finally, it's time to dig into the winter project I've been putting off for the past few seasons: studded tires. After seeing the performance of them on the Wednesday night ride last week and again on Saturday by the commercial pair Jay had, I knew I'd be digging into this soon if the current weather continued. The weatherman says more freezing precip in the days ahead, which will be coating the snow we got last night. So, off to Home Depot for a box of 7/16 pan-head screws. Burned through the project rather quick. A Continental Survival Protection 2.3 was setup for the front and a Panaracer Fire XC pseudo 2.1 was done up for the rear. I would have like to have something larger out back, but that's all that was available in the spare tire rack. I estimated that I put 64 screws in each. Only managed to drill one of of those pointy SOBs in my finger in the process. Duct taped the inside, which was kind of a pain, to cover the screw heads. Installing the tire was no easy affair with all of those razor sharp points sticking out. Hopefully I won't have to pull that one off trailside in freezing temps. These things look bad, like little fangs sticking out on the edges. Testing starts Wednesday, updates to follow. Today's ride was supposed to be an early morning assault at the Frederick Watershed, one hour west of here, to do a dry run of the upcoming Punk Bike course with some of the help. A message on my machine last night indicated a bailout. Guilty parties will not be publicly identified at this time. They can thank me later. Since I know the course (I made it) I decided to stay local instead of eating up my whole day doing the Shed run. This opened up things for a midday hike w/ Julie, searching for the elusive eagles mentioned in an earlier post. 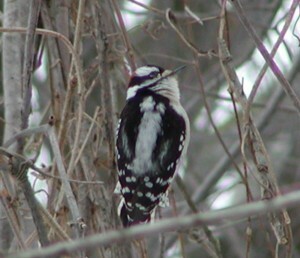 No luck, but we spotted a cool little woodpecker jack hammering some sort of seed pod or bees nest in search of food. We also froze our faces off rather nicely. A quick sandwich and I flipped (or did I flop?) my Surly hub on the 1x1 and now I'm fixed, ready for some traction action at Avalon. It was supposed to be snowing again by now, but unfortunately the forecast has been pushed back. I head out on a late afternoon solo run. Fat tires, low pressure and the fixed gear give me control and confidence. Unlike yesterday, the venue is pure, technical singletrack. Conditions continue to be dicey as the already iced up trails have had new snow cover from yesterday, compounded by yesterday's riders creating more ice tracks. The snow was grippy but there were plenty of ruts and when they grabbed hold of your wheel you just had to go with the flow and fight to stay upright. Kicking a leg out as an outrigger can help, but just remember that you aren't freewheeling and that foot that's clipped in is still cranking. I managed to avoid laying it down the entire ride and didn't see another biker. It was nice and peaceful and rocking out solo let me burn out the whole loop non-stop, which was both fun and useful since it kept the body temp up in the 19 degree weather. Stream crossings are deep and tricky right now, many iced up but not fully frozen. Which generally means you ride a stretch of ice at the approach, dropping off into the middle of the flowing water (or sometimes breaking off as your platform collapses), try to keep your momentum through the deep stuff and wheelie up on the exit edge hoping you don't bust through and come to a grinding halt. More than once water washed over my front rotor and caliper and completely wiped out my braking. It doesn't only happen to rim brakes kiddies. Again, the fixed gear shows it's worth, as you can modulate your speed with your pedals. You do want your front brakes back as soon as possible though (and they return quicker than iced rim brakes) since you can get out of control quick on the downhills, legs flailing like egg beaters as you enter a snowy, iced up turn. It's always good when the ride ends with no injuries or mechanicals. Now I�m kicked back in the warm abode with a home-brewed Winter ale counting down the last hours of the weekend. Hope you made the most of yours. Cheers. Saturday saw more snow and another round of adventure biking, exploring and expanding a route that is meant to offer an off-road riding option when the temperature rises and the trails turn back to an ugly, muddy mess from all the precip we've had recently. Much of the route consists of gravel fireroads, which explains why it can be ridden in conditions that make the local singletrack off limits. Along the route the rocks range anywhere from gumball size to golf ball size and larger. The pure dirt areas are bumpy and lumpy, frozen solid as concrete. Today there's a glaze of ice underneath most sections and a fresh inch or so of snow on top. The snow's still falling during our ride making quite a nice nature scene as we wander through the woods of Patapsco State Park in areas that don't see much use - well, except for the area that is the dirtbag dumping ground. Literally there is a dump (actually a transfer station) about a mile away, but people still find a reason to pollute this area. If you can ignore that, the rest of the route is like an oasis, a wildlife sanctuary. Today we don't see as much as some days, but many deer are spotted at various times as well as two groups of ducks and a few cardinals. No hawks or blue herons, which is unusual. The animals must be hunkered down because of the snow. Perhaps tucked away somewhere eating fermented berries and enjoying the snow scene. We still haven't seen the elusive eagles that are supposed to be nesting at one of the ponds along the route, but I'm determined to find them on one of these trips. 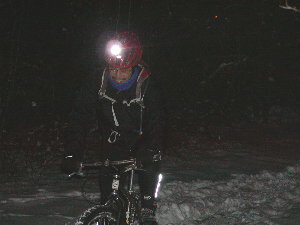 The fixed Cross-check loves this route and the direct-drive proves it's worth in the icy conditions. The 44x17 gear works good on the mostly rolling and flat terrain. The 44c Mutanoraptors perform well in the snow, but Jay has a new pair of IRC studded snow tires on and they adhere to the ice like velcro. I need a pair.